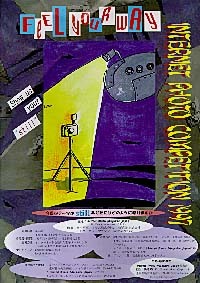 "Internet Photo Competition" by which the second times in this year were counted was participation from South Korea, Mexico, Finland, Germany, Canada, the United States, Chili, Taiwan, South Africa, and variegated countries and became international abundant color event though decreased the application from Japan. The first selection 20 works was done by the IPC1997 EXCO. The final selection was done by photographer Hideki Fujii, Yoshihisa Tsuruta, and Kenji Higuchi. The work is output with the printer PICTOROGRAPHIE3000 made of the Fuji Photo Film Co., Ltd. Limitedand the photograph exhibition of Tokyo Ginza is done by Fuji photo salon (May 30 - June 5). Fujifilm Prize Yuko Akiyama Japan "x36" "x4" "x2"
09 Takeyuki Morioka Let's brake for a break. 17 Hang Joon Kim Cave in China. There certainly is an Internet boom happening around the world !! However this is not the only reason that the 'Internet Photo Magazine Japan' will hold another competition 'Internet Photo Competion' again this year for works accepted through the Internet's E-mail. Last year when 'The First Internet Photo Competition' was held, and we exposed prize winning works, the uniqueness of opening a photograph exhibition in a photo gallery with these works not only created a sensation in the digital world but also in the analogue world. Is this really a photograph? Works riding the digital wave and cresting throughout the world. Having no boundaries means there is no discrimination. There is no doubt that even the passion of the world's dark side can be expressed! This year we have newly established a compact digital camera category. To discover and support outstanding photographers. Photograph entries will be received by digital data through the Internet and the works of outstanding nature will receive prizes. Works will be shown on the Internet, they will be outputed by Fuji Film Co. Ltd.'s printer 'Pictoro graphy 3000' (the compact digital camera class will be exhibited on the monitor), and in addition they will also be part of a photography exhibition held at Tokyo Ginza's Fuji Photo Salon (space 3). The work reception was completed. *Professional, Amateur or Nationality are irrespective in this competition. *Collective works by groups are permitted. *Only unreleased and original works will be accepted. *Copyrights belong to the entrants. If by any chance an infringement of the copyright is made and infringement compensation is sought, the organizer will not be liable and will accept no responsibility. *The entry period for works is under Japan time. *All entries to use Entry paper. *Photographs are permitted to be manipulated in any way but, please state clearly the software used. *The works in the compact digital camera category must be taken with cameras with a regular price of less than 150,000 Yen (US$1,300). *Individual photographs or a series of 4 or less photographs can be entered. *Entered data must have less than 100KB per photograph. *Works from the Compact Digital Camera Category will be displayed in the Photographic Exhibition Hall and exhibited on the monitor screen. The IPC 1997 Executive Committee Leader will do the preliminary judging and nominated works will be selected. Judges will be Photographers Mr Hideki Fujii, Mr Kenji Higuchi and Mr Yoshihisa Tsuruta. Nominated works will be published in the IPMJ from 15 April 1997 and reader's votes will then be accepted. 3 On the CD-ROM which will accompany the magazine published by Impress Co.Ltd. Nominated works will be displayed on computer monitor. Fuji Photographic Film Co. Ltd., Miura Printing Co. Ltd., Internet Magazine, ActPlanNet, inc.